Berkeley: Black Oak Books, 1993. One of an unspecified number of copies distributed on the occasion of a reading by the author. None meant for sale. Broadside 6x11 inches. Designed and printed at Okeanos Press. 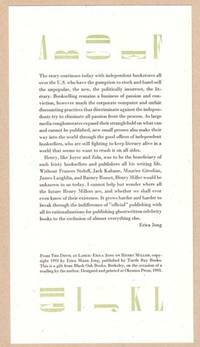 Two paragraph excerpt from Jong's book about Henry Miller. First Edition. Unbound. Fine. Broadside.